to snag your free box! If you follow our page (subscribe to the newsletters) you can get All-Bran Cereals for free!!! 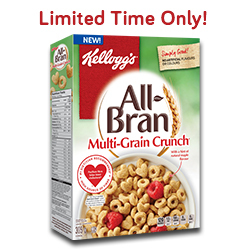 Websaver may offer Kellogg’s All-Bran coupon. Buy 1 box of All-Bran cereal (Any Flavour, 380g – 500g) and get another free. Get a coupon for a FREE Kellogg’s product . can be redeemed for any variety of Kellogg’s* All-Bran* bars (180g). Limited Time Offer. While Quantities Last.